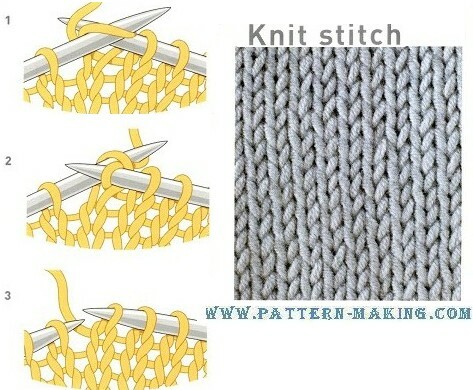 Knit stitch: This is the first stitch you learn and is abbreviated in knitting patterns as k. It creates a simple ridged fabric known as garter stitch when worked on its own. When worked in alternate rows with purl stitch opposite!. it forms a smooth textured stitch known as stocking stitch (right) Knit stitches are formed by inserting the tip of the knitting needle through from front to back of each stitch, passing the yam around the needle and drawing a loop through. How to work the knit stitch 1 Insert the tip of the right needle through the first loop on the left needle, from front to back. Then wrap the working yarn around the tip of the right needle. 2 Pull the tip of the right needle and the yarn through the loop on the left needle. r 3 Slip the old loop off the left needle to complete the stitch. Continue knitting stitches in this way until all the stitches on the left needle have been knitted onto the right needle. You have now completed one row of the knit stitchPurl stitch This is the second stitch to learn and is very similar to the knit stitch. If all rows are purled a garter stitch fabric is created. When purl rows are combined alternately with knit rows. they form stocking stitch. The purl side of the stocking stitch fabric is called reverse stocking stitch. When a purl stitch is worked the yarn is held at the front of the work rather than at the back of the work as with the knit stitch. How to work the purl stitch 1 Insert the right needle through the front of the first stitch on the left needle from right to left and wrap the working yarn around the tip of the needle as shown. 2 With the tip of the right needle. pull the yarn thr’ou9h the loop on the left needle . 3 Slip the old loop off the left needle. leaving a new stitch on the right needle. 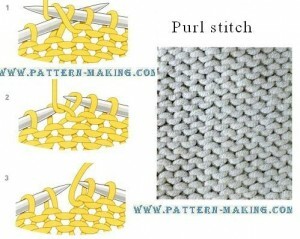 This completes the purl stitch. Continue in the same way until all the stitches on the left needle have been purled. This completes one purl row.